My wife and I are GRANDPARENTS! 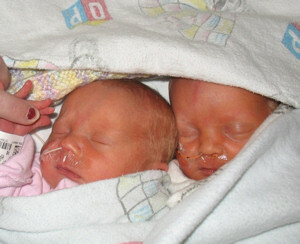 Marissa and Zachary They still have feeding tubes in but are eating on their own – they were a little small (Marissa 4 lb. 12 oz. and Zachary 5 lb. 6 oz.) at birth but should only have to stay in the hospital about two weeks. Our daughter-in-law is doing fine now except for lack of sleep. By the way, Zachary means “the Lord remembers” and Alden was my father’s name. Marissa means “sea-loving” and Charis (pronounced KAR-is, not CARE-is) is Greek for “Grace” – neat huh? We are very happy with the twins and the names – great job Matthew and Jaime!